Devastating and compelling, Hotel Mumbai pulls no punches in terms of violence and intensity. A story which could very easily be from today’s headlines, the 26/11 attacks in Mumbai took place over a decade ago, but the story feels sadly as present day as ever. Cutting through the carnage, a terrific performance from Anupam Kher, as a hotel chef who saves dozens of lives, provides the film some much needed deeper emotional connection. Hotel Mumbai wants to take us into the heart of terror, but flirts with exploiting the tragedy, rather than depicting it. The reliance on composite characters and centrally locating the film to one location, when a dozen attacks took place all over the city, might understandably rub people the wrong way. This is a very difficult film to watch if you are sensitive to gun violence, violence in general, and bloody imagery shown on screen. The film contains several moments of sudden, startling violence and is not for the squeamish. On November 26, 2008, ten members of the Lashkar-e-Taiba terrorist organization arrived by lifeboat on the island coast of Colaba in Mumbai, India. Originating from Pakistan, the men found their way into the city and in a few short hours after making landfall, they would unleash a series of coordinated attacks throughout the business and financial sector of the city. Over the course of four days, more than 170 people would be killed, over 300 wounded, and the police force in the city overwhelmed with the scope and range of the plan set forth by the Pakistani-based assailants. Hotel Mumbai, based on real events, takes the vast scope of chaos and tragedy unleashed in late-November 2008, as co-writer/director Anthony Maras distills everything down to largely one location - the luxurious Taj Mahal Palace Hotel. Within the spacious walls of the hotel, hostages and attackers come together, nearly always with horrific results. Much of Maras’ debut film takes place within the many floors, stairwells, and private clubs housed inside the five-star establishment. Maras, working with a script he wrote and researched with John Collee, infuses truth within the fictionalized, composite characters they have crafted to guide us through the unthinkable tragedy we will watch unfold. Among the main characters: Arjun (Dev Patel), a kind-hearted waiter with a young family; David and Zahra (Armie Hammer, Nazanin Boniadi) and their nanny, Sally (Tilda Cobham-Hervey), traveling with their infant son; Vasili (Jason Isaacs), a Russian philanthropist with questionable morals; and Hemant Oberoi (Anupam Kher), the head chef of the Taj Mahal, Arjun’s boss, and a key figure in saving dozens of lives during the assault on the hotel. We are approximately 20 minutes into the story when the attacks begin, as two assailants simply walk out of a bathroom at a train station and calmly open fire on anyone who moves or even looks their direction. Through bluetooth communications, we hear the attackers in conversation with “The Bull,” a point person of sorts offering words of encouragement, reminders as to why jihad is necessary, and updates on media reports and information. From those opening moments of gunfire, the air instantly leaves the room for us as viewers. The nonchalant, expressionless way with which the young men carry out the attacks is chilling and Maras impressively creates a palpable sense of terror, horror, and dread as we fear what may come next. The violence is graphic, sudden, and startling. Not every major character Maras and Collee bring before us will make it out of the movie alive. The sound design work is masterfully created, giving us an almost Pavlovian-like response anytime we hear the crack of a gunshot or a knock on a door. And though Kher gives a terrific performance, as the master chef of the Taj Mahal, who, along with Arjun, arranges hotel attendees to secretly sneak into a private club with no internal windows or other notable markings, the film feels almost lost at times without the violence. I know how that sounds: And to be clear, Hotel Mumbai does not need more violence. However, it desperately needs more character development, beyond just a ragtag crew of international visitors who feel as if they were constructed with an outline of basic character traits. The film’s largest flaw is that we never get to know any of the people swept up in such an unthinkable tragedy, despite Maras giving us some pretty basic back stories to follow. David and Zahra travel with a nanny, have an infant son, but other than Zahra being able to recite the Quran in a pivotal scene, we have next to no background as to who they really are. When the couple is separated, Zahra is befriended by Vasili, a Russian high-roller who seemingly just decides that, in a sea of dozens of hostages, he will be extra nice to her. His motivations are absent, Isaacs is given few, if any, substantive lines, and the movie languishes when we are asked to care about someone we know nothing about. Characters matter in a story like this, especially if we are asked to make emotional connections to their experiences. Perhaps Maras felt it more true to place us in the chaos and bear witness to the anguish of what the Taj Mahal Palace Hotel residents, and others around the city, felt during the jihadists reign of terror. 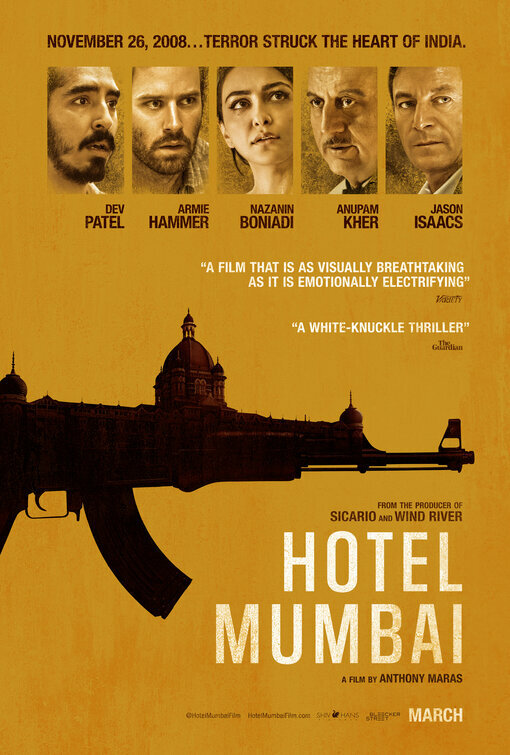 In that regard, Hotel Mumbai is searing, visceral filmmaking, and Anthony Maras’ debut is stunning from a technical standpoint. However, with largely one-dimensional characters, and a significant number of non-Indian actors playing prominent roles, Hotel Mumbai feels like a project lost in the churning demands of commercialism and credibility. The pieces are there, the terror intense - yet somehow Hotel Mumbai struggles to find that lasting emotional staying power stories like this one deserve. Starring: Dev Patel, Armie Hammer, Nazanin Boniadi, Anupam Kher, Tilda Cobham-Hervey, Jason Isaacs, Amandeep Singh, Suhail Nayyar, Manoj Mehra, Dinesh Kumar, Amriptal Singh, Kapil Kumar Netra, Angus McLaren, Natasha Liu Bordizzo.